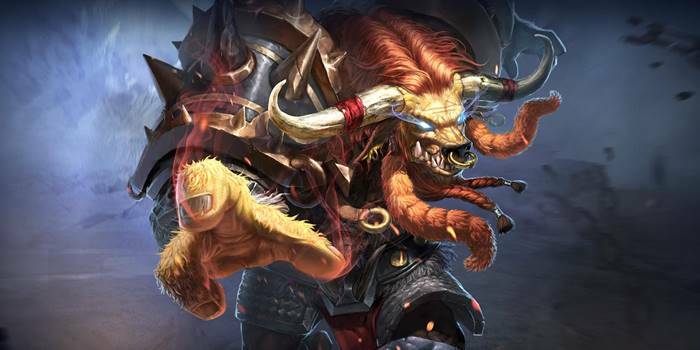 Guide for the hero Toro, a character in Arena of Valor (AoV). Included are Toro’s abilities, statistics, attributes, strengths, weaknesses, and more. These are Toro’s attributes on the mobile version of Arena of Valor. Click here for his attributes on the Nintendo Switch version. Toro lunges towards his enemies, causing 115 (+1 AD)ˀ physical damage and knocking them into the air. Does not knock epic creatures into the air. Toro bellows with rage and gains a shield that absorbs 250/300/350/400/450/500 damage. Also deals 375/425/475/525/575/625 (+1.2 AD) physical damage to enemies within range and slows their movement speed by 35% for 1 second. Shield lasts until after animation ends. Toro leaps to the target area and stomps the ground 3 times. The first 2 stomps deal 150/200/250 (+0.75 AD) physical damage, and the third stomp deals 300 (+1.5 AD) physical damage. The first stomp reduces enemies’ movement speed by 30% for 1 second; the second stomp reduces enemies’ movement speed by 50% for 1 second; the third stomp knocks enemies into the air. Toro’s passive gives him excellent maneuverability. When you think you’re about to be immobilized, use an ability to counter those effects. Cooldown speed and HP are incredibly important, so try to purchase items and arcana that boost these attributes. Our recommended order for Toro abilities as he levels up. See all of Toro’s item builds.